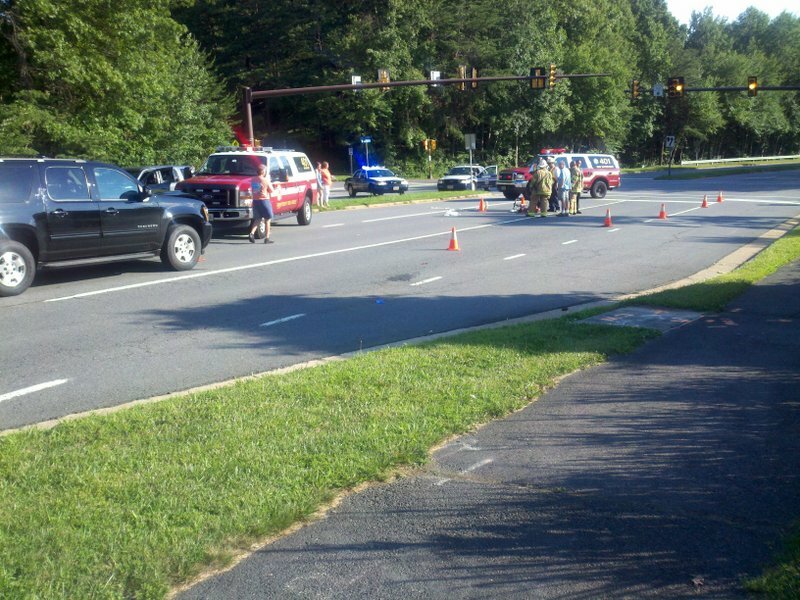 A woman cyclist was struck by a motorist at the intersection of the W&OD Trail and Sunrise Valley Drive today at around 5:45pm. We were contacted by the person who called 911. The cyclist was taken away in an ambulance. We received the photo at the right from a FABB member who arrived a few minutes after the crash. The photo was taken from near the W&OD Trail looking toward the traffic signal at Cross School Road/Robert Fulton Drive. 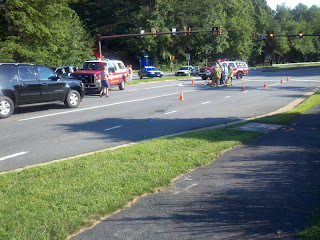 It appears that the cyclist was thrown forward a considerable distance after being struck by the black SUV in the photo. This is a dangerous intersection. There are two lanes of traffic in each direction. What often happens on roads like this is that a motorist in the far right lane will stop for a cyclist, the cyclist proceeds into the intersection, and a second motorist does not stop and hits the cyclist. This has happened multiple times on Wiehle Ave at the W&OD Trail. In some states it is illegal to pass another motorist who is stopped at a crosswalk. Virginia needs such a law. If you know more about the condition of the cyclist, please leave a comment. Update August 6: Many people have asked for an update on the injured cyclist. Her name is Cat Freck. She is an amateur racer with an extensive list of race results listed on the USA Cycling website, including 19th place in the Air Force Association Cycling Classic in the Pro/Cat 1/2 class. Her family is maintaining a Caring Bridge site that includes updates on her condition. She was... "hit by a large SUV while crossing Sunrise Valley on the WOD last night early evening. She is currently in the ICU at Fairfax Inova. She will be in there for at least a week due to being heavily sedated (so she doesn't move and isn't' in pain). The good news is that she has no head trauma or internal bleeding, which is wonderful to hear especially due to the extent of her other injuries. I think they set one of her legs a bit today so the healing would start happening in the correct direction, but she won't do any more surgeries for about three days as her body calms down bit. :-( She will most likely be in the icu for about a week according to doctors and her husband. She is completely unresponsive due to the heavy sedation ...."
I was with her before the first responders arrived. I would love to have an update as to her condition. Thank you. The cyclist is Catherine Freck from Vienna. Bike racer, personal trainer and group x instructor. She was actually air lifted and is in the ICU at fairfax. She will be there for about a week. NO brain injury and broken legs, pelvis, shoulder, hand and ankle. Hoping for a full recovery! Just curious what local racing list ? Thank God she didn't get a head injury given the apparent severity of the collision. Hope she recovers fully. Do we know how the collision occured? Did one motorist stop and the other continue, or another scenario? Thanks. Same situation if not worse at Sterling Blvd/WO&D only with two additional lanes of traffic. Cyclists need to be defensive.The hospitals and cemeteries are full of cyclists who had "the right of way". The best approach I have found at these multiple lane intersections is to step off the bike and become a pedestrian. It may be inconvenient and skew your strava times but well worth it. I'm with Frank; I cross those intersections assuming every driver of every car is looking down at his mobile, like I'm invisible. I'd say the biggest risk for me on the W&OD is other bikes moving too fast, especially in packs. To me, the trail has too many kids and dogs to go more than 15mph. Glad to hear that she will survive. Drove by shortly afterwards and was afraid that it was going to be a fatality based on what I saw of the bike. Sterling and sometimes Wiehle. Being the pedestrian is annoying, but probably safer. Today texting while driving became a primary offense in VA but I doubt it will be much of a deterrent. Too many loopholes. Sigh. I'm glad the cyclist survived. With sun angle that time of day, if I'm in my car I slow WAY down where the trail crosses the Reston roads. If I'm on my bike I try to keep in mind that the sun angle is working against me. I agree with Frank's observation. As a rule, I will not cross in front of a driver who is not looking at me. Sometimes they look like they are slowing down to let you go, but they are dialing or texting. I like the idea of a change in the law as far as one car having to stop if another does at a crossing, I don't think the possibility of a ticket will do much to keep us safer. Because bad drivers are not deterred by tickets. In this accident, was any ticket issued? What appears to be the cause? Or is it still too early to tell? My thoughts and prayers are with the cyclist. My thoughts and prayers certainly are with the cyclist, but also with the motorist, who cannot be enjoying this experience either. Most of us learned at our mother's knee to "Look both ways before crossing the street, dear." We fail to follow mother's advice at our peril. I live near this intersection and the cyclists scare me to death. I wish they would realize that these crosswalks are not 4-way stops -- they are not intersections. The cyclists MUST stop completely, not cruise over the cross walk, slowing and speeding up depending on how the cars are passing through. They should only cross when there aren't any cars coming at all, not just when one car has stopped or slowed down. I have a friend who is a police officer and she said that it is dangerous for cars to stop at the crosswalks. They must continue moving with caution and it is the cyclists responsibility to stop and let the cars pass over. Motorists are required to yield to pedestrians and bicyclists in a crosswalk. It is only dangerous for motorists to yield at a crosswalk if they are driving in a distracted or reckless manner. Police need to enforce the crosswalk law. While there is a STOP sign for trail users at the W&OD Trail crossings, even if the signs are enforceable it doesn't mean that motorists aren't required to yield to pedestrians and bicyclists once they are in the crosswalk. Trail users can't enter the crosswalk in disregard of oncoming traffic, but if motorists can yield, they are required to by law. A terrible, terrifying collision -- the cyclist was thrown at least 25 feet, based on where the car stopped, where the crumpled bike landed -and where the victim was treated by EMTs. Prayers to the cyclist. Based on the dent in the hood of the SUV, the SUV must have been going fast. Cars need to slow down and be cautious, also. How is she doing ? YES, drivers are required to yield to cyclists and pedestrians IN the crosswalk. The problem comes when cyclists ignore THEIR side of the law, which is to OBEY THE STOP SIGN. A stop sign does not indicate to stop and then proceed; it indicates to come to a full and complete stop, and then to proceed ONLY when there is ample time and space to cross the intersection before any oncoming traffic reaches it. Seriously, folks... did your moms REALLY teach you to stop at the corner only long enough to jump out in front of a car? "The driver of a vehicle approaching an intersection on a highway controlled by a stop sign shall, immediately before entering such intersection, stop at a clearly marked stop line... Before proceeding, he shall yield the right-of-way to the driver of any vehicle approaching on such other highway from either direction." The law says nothing about a stop sign on a trail. At least 2 cases in which cyclists have been cited for not coming to a complete stop at the W&OD Trail stop signs have been thrown out of court because of that wording. There is a contradiction between having a stop sign in front of a crosswalk. The two laws that regulate behavior in these two instances are contradictory. "No pedestrian shall enter or cross an intersection in disregard of approaching traffic." It also states that "The driver of any vehicle on a highway shall yield the right-of-way to any pedestrian crossing such highway..."
We all need to use common sense. Motorists need to yield to pedestrians and bicyclists in a crosswalk. Cyclists need to stop at these crossings and wait until they can safely enter the crosswalk. I think Bruce said it well. No, cyclists should not jump in front of cars. And drivers should not run cyclists over. And we all should be aware of the simple fact that accidents happen and do our best to behave in a way to try to avoid them so as not to bring harm to ourselves and others! "Where a shared-use path crosses a highway at a clearly marked crosswalk and there are no traffic control signals at such crossing, the local governing body may by ordinance require pedestrians, cyclists, and any other users of such shared-used path to come to a complete stop prior to entering such crosswalk. [...] At such crosswalks, no user of such shared-use path shall enter the crosswalk in disregard of approaching traffic." Anonymous 6:01pm, you are right, that change was made in this year's legislative session and recently went into effect. It was sponsored by Senator Favola at the request of Loudoun County police who understood that the W&OD trail stop signs were not enforceable. No local jurisdiction has yet passed such an ordinance. As I said earlier, we all need to be considerate and respectful of other users on the road and on the trail. Bruce, I agree that everyone, regardless of mode of movement, should exercise caution. I also believe that everyone, in all circumstances of life, should show consideration and respect of others. However, I believe that our translations of these sentiments into reality differ. A vehicle coming to a sudden stop in the middle of a roadway is a hazard, period. Drivers should NOT stop their cars for users of the trail who are stopped at the stop sign, nor should they come to a stop at an empty crosswalk in order to peer down the trail and see if anyone may be approaching. Those with the stop sign are responsible for STOPPING and continuing only when there is a break in roadway traffic large enough for them to safely traverse said roadway. I mean, come on, we all know what a stop sign means. To argue about whether or not the courts can enforce people obeying the sign is absurd; obeying the sign behooves you, because it is there for your own safety! Even if there were no stop sign, though, it's common sense for anyone attempting to cross a road to STOP and LOOK first. Existing law states that someone entering a crosswalk shouldn't do so in disregard of approaching traffic. The crosswalk might as well not be there given your interpretation of how trail users should act when there is a STOP sign on the trail. To say they must "wait until there is a break in roadway traffic large enough for them to safely traverse said roadway" implies that motorists don't have a responsibility to yield to someone in the crosswalk which is contrary to what the law states. I think we've both made our points so I'll stop arguing. If anyone knows about the current status of the cyclist, please leave a comment. First of all you are all wrong about the legal references from the code of virgina. The stop signs on the W&OD are not enforceable by state code. It IS the cyclist responsibility to wait until there is a break in traffic. The state code does say that a motorist must yeild to a "pedestrian IN a cross walk." The person must already be in the crosswalk to require a motorist to yeild to them. If the pedestrian has not yet entered the designated portion of the highway for crossing the motorist has no responsibility to stop. That said there are other state codes and county codes that would be applicable under these circumstances where the motorist and the cyclist could be held at fault. I think you are all missing the point here. Instead of quibling over the state code regrding stop signs we should be reckognizing that a woman was seriously hurt. Weather it was the fault of the motorist or the cyclist it is a tragedy. Get it together folks and dwell on the important things not the minutia that means nothing. I work, cycle, run and drive in this area all the time and we all need to pay better attention to what is going on so that tragedies like this can be avoided!!!!!! Not to belabor the point, but the Code of Virginia doesn't say motorists have to yield to pedestrians "in" a crosswalk, it says "at" a crosswalk. A minor but important difference, imho. Here's the way someone described Virginia crosswalk law to me, using an analogy most of us can relate to. If you're a driver coming up to a traffic signal, and the light turns yellow, you have two choices: go through the intersection, or stop. The yellow light is timed to be long enough that all drivers can do at least one of these things safely by the time the light turns red. Now, if you're a pedestrian or a cyclist and you come to a crossing with no signal, when you step into the crosswalk you're like a red traffic light--drivers have only one option: they must yield to you. So here's the thing: Since you're the red light, you can't just barge into the crosswalk so fast that approaching drivers don't have time to react. This wouldn't leave enough "yellow" for drivers. But you also don't have to wait for every car in sight to pass by. Yellow lights are usually 4 to 6 seconds, depending on car speed. If you step into the crosswalk when the nearest car is 4 to 6 seconds away, and if you're visible to that driver, then that driver has enough time to yield to you and thus is legally required to yield. You have done your duty and not crossed in "disregard" of approaching traffic, as the Code requires. A driver who does not yield to you in this situation is breaking the law. Disclaimer: I'm not saying this is the best way for everyone to cross every street, I'm just saying this is what the Code of Virginia says. Pat, Thanks for that info. It's a good explanation of how the code is supposed to work. To add to your comment about entering the crosswalk when motorists have time to stop, it applies to each lane. If there's a 2 or 3 lane road (4 to 6 total lanes), just because one motorist stops doesn't mean the others will. I always proceed one lane at a time. It doesn't really matter who is right and who is wrong, in the end the cyclist or pedestrian will always be the loser. With this in mind always ride as though your life depends on what you do, because it does. I've ridden tens of thousands of miles in the area and the one thing that Ive learned is to NOT become a pedestrian by getting off your bike. You are better off stopping, being attentive, then getting through the intersection as quickly as possible. The longer one takes to cross an intersection, the higher the probability of being a target.